The Windows Store is still playing catch up with the Apple App Store and the Android Market. The number of apps available is higher than 165,000, and while that doesn't quite compare to Android and iOS, Microsoft says that 46 out of the top 50 apps on the other platforms are already available for WP8. The Music section is actually the Xbox (previously known as Zune) Marketplace. Its structure is similar to the Application section. First, a featured artist of the week, three more featured artists, then a list of new releases, top albums and genres. 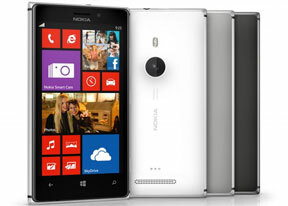 Being a high-end Lumia smartphone, the 925 gets the Drive+ navigation suite for free out of box. Unlike Drive available on lower-end Lumias, Drive+ has global coverage, meaning it can easily be used abroad. And since it's available offline you don't have to worry about roaming data charges, either. HERE Drive+ offers free, life-time voice-guided navigation anywhere in the world. All you have to do is download a voice in your language of choice and you're good to go. Of course, to make use of the key selling point of Drive - offline navigation - you have to download a map for a country of your choice, too. With Drive+ you can easily plan routes (all offline, unlike the early iterations of this app) and you can tweak various settings for each route - fastest/shortest/economical route can be selected and you can choose whether the app will use or avoid motorways, toll roads, ferries, tunnels, unpaved roads and motor trains. There are icons to remind you of the selected settings. Drive+ uses big, clear instructions on its screen in addition to the voice prompts, which is ideal for in-car use. You can switch between 2D and 3D mode and switch the color scheme (day, night, auto). There are speed alerts and real-time traffic information. The most recent update to the HERE suite (from just this month) adds an overview of traffic conditions in your area, including your drive to and from work with the My Commute app. My Commute shows you an at-a-glance look at your specified commute with a special Live Tile on your homescreen. You can setup up multiple commutes as well.